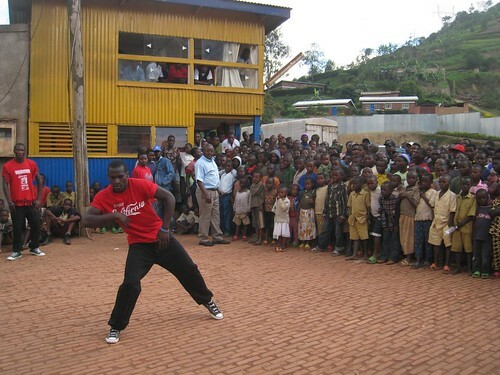 A song and dance performance for children in a Rwandan town. It's been about 6 months since my press trip to Rwanda. Looking back, I still feel incredibly lucky to have had the opportunity to hop aboard Ethiopian Airlines and jet off to eastern Africa for a week. The jetlag was rough, and we had a tiring itinerary, but the sense of adventure was high, and I shared the journey with friendly, talented writers and photographers. For more, see the full listing of the posts associated with my adventures in Rwanda. When I introduced Friday Flashbacks a year and a half ago, my goal was to give new readers easy access to my previous travel experiences. As I've been traveling less frequently since then, I'm all caught up! The weekly videos will be now be published on Fridays instead of Saturdays. I’ve always wanted to go to Africa. I’ll get there eventually! Wow! Such a nice place. I have always wanted to go to Africa. A very close friend of mine just spent the last year in Rwanda. The stories she tells are amazing, many of them are really sad but there is always a lot of hope shinig through. They seem like a beautiful, loving and forgiving people. Hey Sofia, in my short time, I certainly had the impression that Rwandans are doing their best to build a stronger country, without forgetting their past. Just read through your Gorilla Trek story and the photo essay and now looking through more archives. It seems like a great experience seeing them in the wild. The photos are beautiful. Are they used to humans? Arun, thanks for checking out my Rwanda experiences. Yes, the Gorillas have become familiar with humans given the amount of time researchers and tourists have been visiting them. This is so great that I had to comment.